Just another day on the sea near Trinidad. Photo by Michael Morris. It was April 23, 2006, when I first realized that the ocean has a heartbeat. I was participating in a Godwit Days tour of Trinidad Bay led by Marna Powell, owner of Kayak Zaks, and Michael Morris, a local birder. I had been in a kayak before, but this was my first time on the ocean. As Marna pushed my kayak past the small surf break, I could instantly feel it, the rhythm of the sea. I was captivated by the intense pounding, and with each small swell I could hear it and feel it more, as if it were embracing me, and beckoning me out farther into its waters. I don’t remember seeing any birds that day, but I do remember hearing the sound of the water as it swished around the rocks, the thump of the kelp as it hit the bottom of the boat and the sound of water dripping off the paddle and back to its root. I was in love. I had discovered a new world that I needed to explore and become a part of, which is why I was so thrilled to discover Explore North Coast, a local sea kayaking association. Through Explore North Coast, I have met some wonderful people, many of whom I now paddle with on a weekly basis. These people introduced me to many of our local paddling areas, including Trinidad, which is a gem that we are blessed to live so close to. 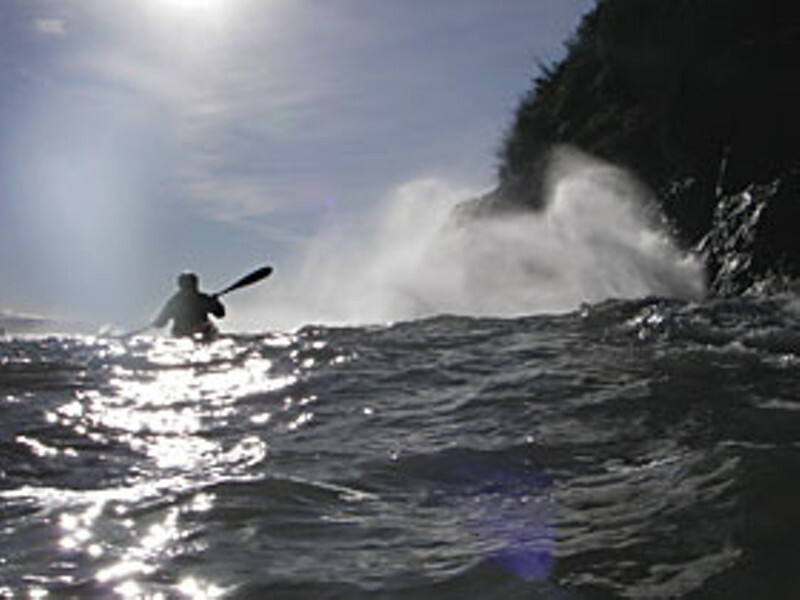 One of the greatest things about sea kayaking is that the ocean is constantly changing. A set of rocks during low tide can offer colorful, tide-pooling opportunities. The same set of rocks during high tide might provide passages to move through, and exciting places to explore. The water moving between a set of rocks can be still and flat, or resemble the water in a washing machine. Often these changes occur instantly. It was a calm day last fall, and a group of friends had decided to do a sunset paddle off the coast of Trinidad. Being new and naive, I didn’t hesitate to follow three of my friends through a narrow but long slot between a large split rock. As I made my way through I became mesmerized by the huge walls on either side of me, and suddenly I heard a noise. It was the sound of water being sucked away. I quickly realized that the water was dropping out of the slot, and starfish and sea anemones were being exposed that had been underwater seconds before. Instinct told me that the water that had left would come back in quickly, and it did. With the sound of rushing water I felt myself getting hit from behind, and I realized that I was surfing, directly toward the sloping rock on my left. I felt the front of my kayak hit and, in what seemed like slow motion, I rolled over to my right. I quickly grabbed the loop on my sprayskirt and tore it off, exiting the boat. Following my friend Damon’s instructions, I swam out of the slot, pushing the boat in front of me, and performed what is commonly called a T Rescue, an assisted rescue performed in deep water. This experience was humbling to me. The three friends that had entered the slot before me had not encountered any rough water, and after my rescue I didn’t see another wave move through in the same manner. It was a reminder that the ocean is not predictable and that its personalities cannot be ignored. I developed a deep respect for the ocean that day, and it was several months before I went anywhere near that slot again. Sea kayaking is not just about the water, it’s also about the marine mammals that make the ocean their home. Harbor seals, river otters and harbor porpoises are common visitors to Trinidad, and although my friends and I are careful to give them their space, they often follow us, poking their heads out of the water just feet away. Stellers and California Sea Lions are common in the deeper water surrounding Trinidad Head. Looking at these majestic creatures I often feel both fright and wonder as they bark ownership of the rocks. Their presence is so empowering, that I, as a kayaker, often feel blessed that they allow me to paddle where they reside. These and other kayaking experiences have changed my life. Whether it be for a calm paddle, an exciting experience or just a time to trap out the stresses that life often throws at us, I’ve found solitude in the ocean. I’ve learned to trust that the ocean is unpredictable, and have found comfort in this. I’ve also never stopped hearing its heartbeat, and I hope I never do. Two years ago, I bought a recreational kayak, a PFD and a paddle. I had no idea what I was doing, but I started taking my kayak out on the lagoons a couple of times a week. I didn’t know any other kayakers, and I didn’t know anything about rescues or any other aspect of the sport. Adventure’s Edge, a store in Arcata, was helpful in giving me direction, and pointed me toward an event called Paddlefest. I arrived in my usual kayaking attire, sweat pants and a cotton t-shirt. The people at the event were very kind and embraced me into the kayaking community, gently hinting that my outfit was not suitable for kayaking and that I would benefit greatly from taking a class on “dressing for the water.” Throughout the weekend I took that class and many others and met lots of amazing people. This Saturday and Sunday, Sept. 29 and 30, is the fifth annual Paddlefest. It is also the official grand opening for the Humboldt Bay Aquatic Center. The event provides live music, water clinics, demonstrations, land classes, games and races. It is a great place to meet people who have a passion for the water. For more information, visit humboldtbaypaddlefest.com. When not kayaking, Helen Wilson works as a graphic designer and writes a weekly column in the Arcata Eye.